I haven't sent out a newsletter for a while but the reason will become apparent when I tell you what I have been doing. As you may know I have been on the Craft Stash Design Team for quite some time and I cover lots of the new products that they supply. I also cover four of the Crafting Magazines that are brought on to the market for you each month. It gives me the greatest of pleasure to show you my new collection. 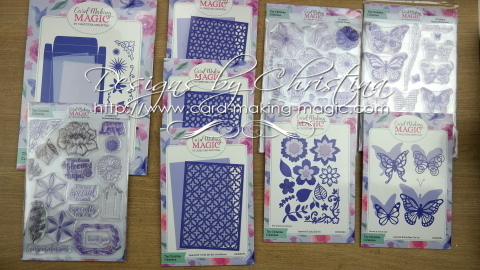 The main part is the Complete 5x7" Card & Box Die Set which will help you to make the most fabulous boxes to match the cards that you make ... all in one easy to use die set. I am adding videos to show you how to make the box in two styles and how the clever card die will work too. There are Butterflies and Flowers that have matching stamps to make them come to life even more. 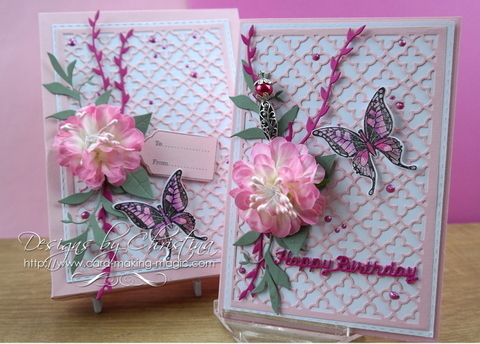 And beautiful Trellis panels to add that special touch to your card and box. And so many ways in which everything can be used. You will need to add some information too when you add photos. If they are just a one line descriptions I am sorry but I cannot accept them. You don't need to write an essay but some basic details would help. Materials used and any dies that you have used too. I have added a Winners Page for you to check for your name and also past winners. Please become a subscriber so that you will get notification whenever I add a new tutorial and as I add them each week ... sometimes two or three ! !